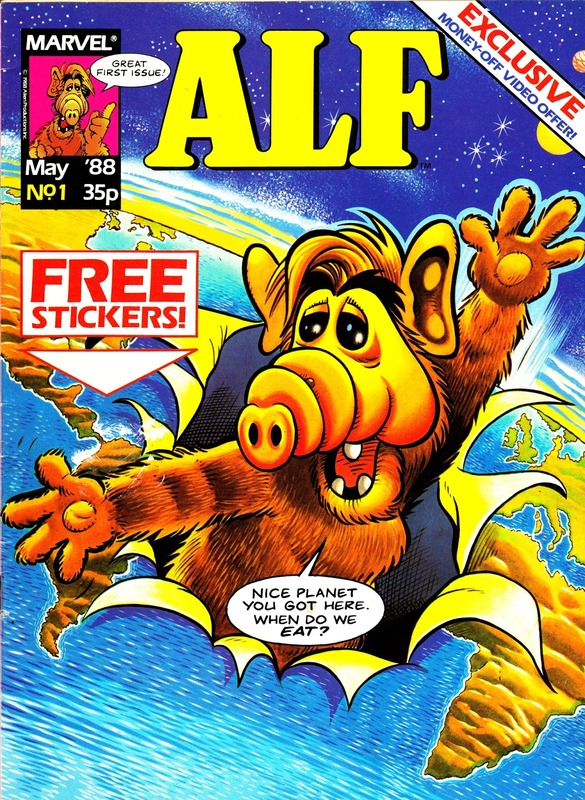 Here's a pop-culture icon that's fallen on hard times (for some reason, I always think of him as America's Roland Rat): ALF (Alien Life Form). Star of primetime (in an undemanding sitcom that ITV aired - early on Saturday evenings I think - in the UK) and a Saturday morning animated series (which I'm sure turned up somewhere in the UK, although I don't ever remember seeing it myself), the wisecracking, cat-chasing alien from Melmac was - briefly - huge. No surprise then that Marvel New York would acquire the comic book rights. At its peak, I think they were churning out titles and spin-offs based on both screen versions which gave the Annex of Ideas plenty of material to reprint. I have no idea how long this monthly ran for but it merged with THE MARVEL BUMPER COMIC from issue 28. In fairness, readers would have been hard-pressed to spot the difference as the ALFster had been moonlighting in the Bumper Comic from the beginning. He retained cover billing for the rest of the run, which ended with the 31st issue. See here for more on THE BUMPER COMIC.